then list things or activities that keep me away from blogging. 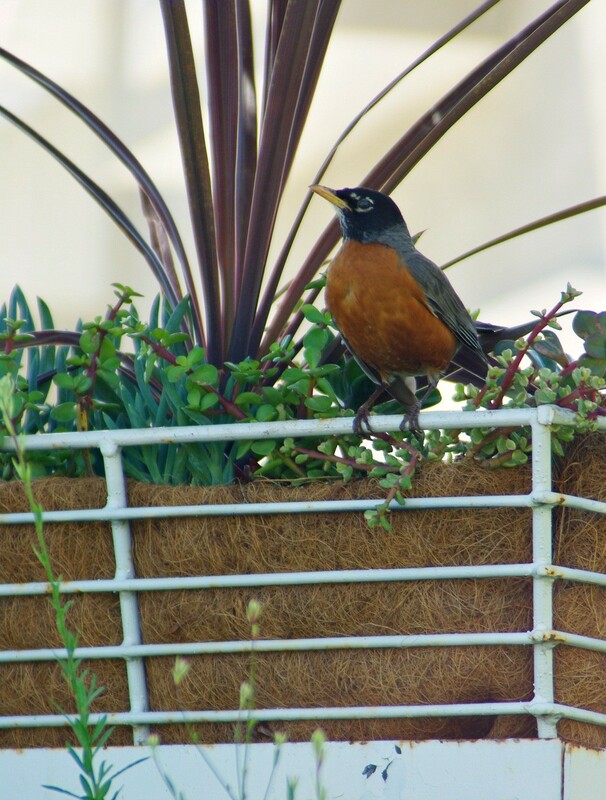 One such activity at this time of year is gardening or as I see it, playing in my flower beds. I truly believe the outside of a house, meaning the yard, tells a whole lot about the people that live inside. 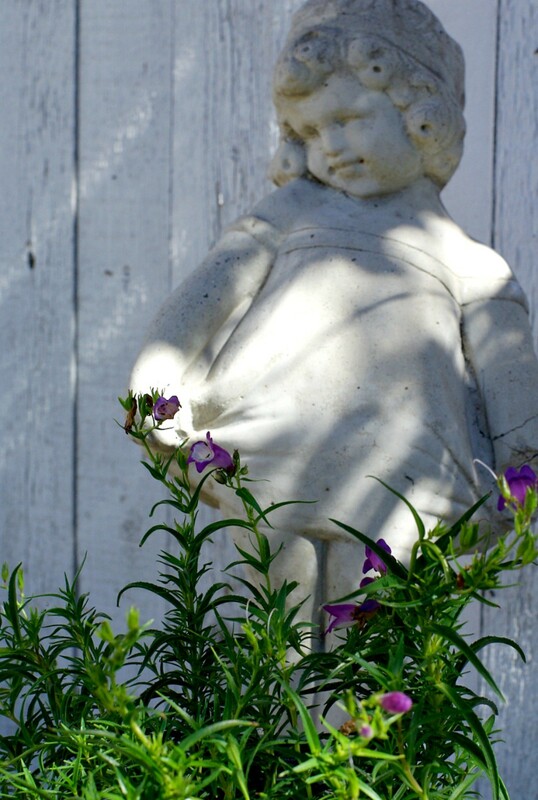 Therefore, when gardening I like to add some fun art and whimsy to the yard. This year I decided my front yard center mound was ready for a redo, a total make-over. So I started from scratch pulling out all the old bushes and plants and leaving only the tree. I then brought in new dirt (isn’t this so lovely, I do love some dark new rich dirt) which followed with a trip to the nursery where I purchased a whole new set of perennials. The next step was to place them around the mound getting a feel to how they would look, one thing to keep in mind, always have a plan as to what color scheme you want before shopping. Then I began planting. After the perennials were in I could then add color with annuals. I chose to go with pinks and purples so I bought geraniums, petunias, lobelias and alyssum. I think its kind of fun to add character to your follow beds by placing pots right in with the plants. You can easily put in an old wheelbarrow, a chair, a wagon, you name it. 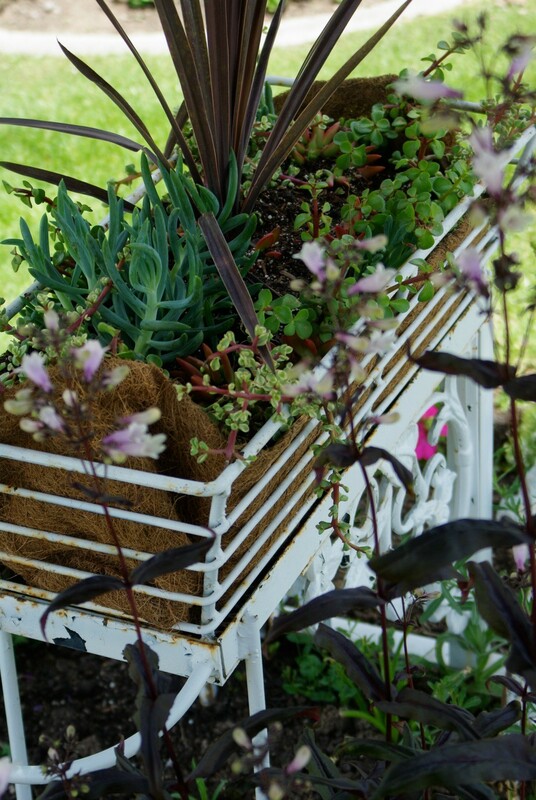 I chose this old wrought iron cart and then planted some succulents inside. I’m not the only one who enjoys this. On the other side I spray painted an old terra cotta pot white and placed a store bought planter right inside. 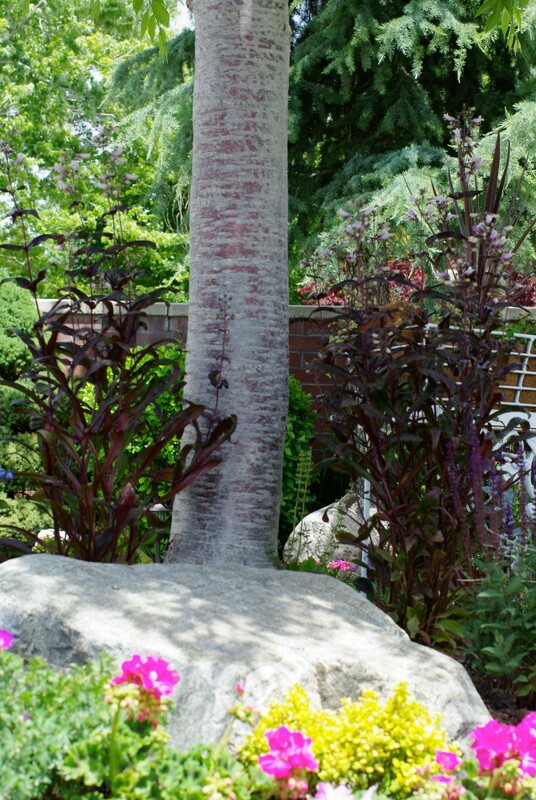 I like the different height and color it adds to this mound. Now I just get to sit back and watch it all grow. 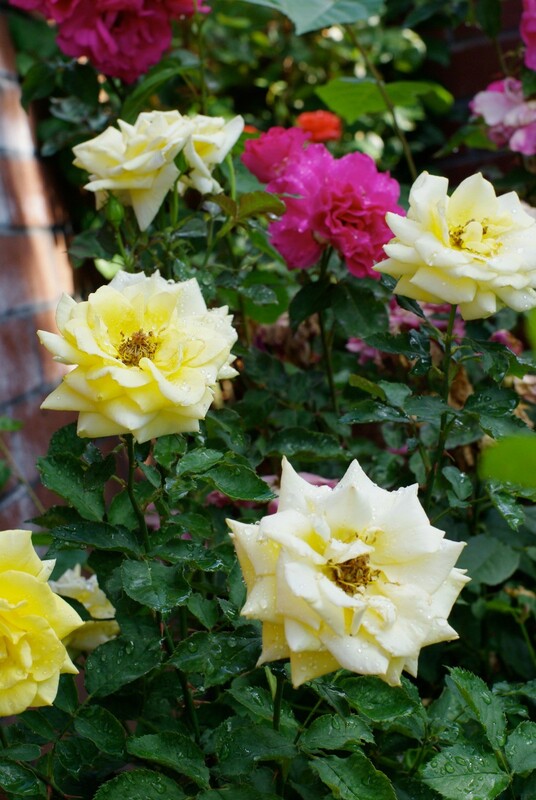 I don’t think my husband would agree, but in my heart, a garden is not complete without roses. Now take a walk with me into my back yard where the magic really begins. . .
It’s the place I really get to play around . 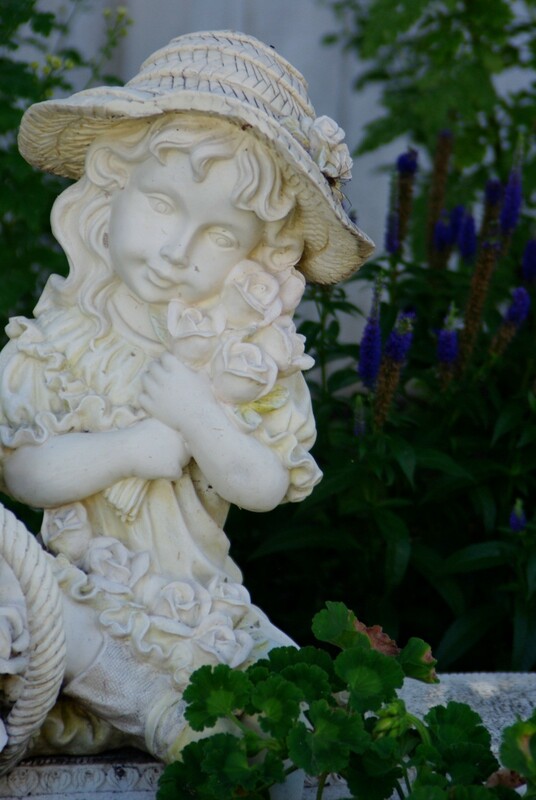 . .
where garden angels exist . . .
even wearing my crowns . . .
this is hanging right above the Fairy Garden . . .
just waiting for Miss Molly (my granddaughter) to come for a visit. 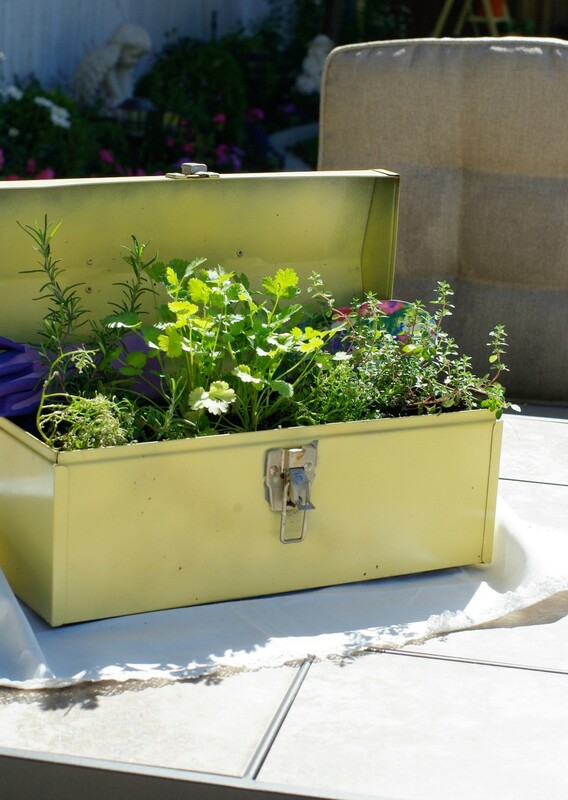 And when you want to sit back and relax, you can join me here with my toolbox of herbs. As always my friends, thanks for dropping by. Have a most magical day. I love all your angels! 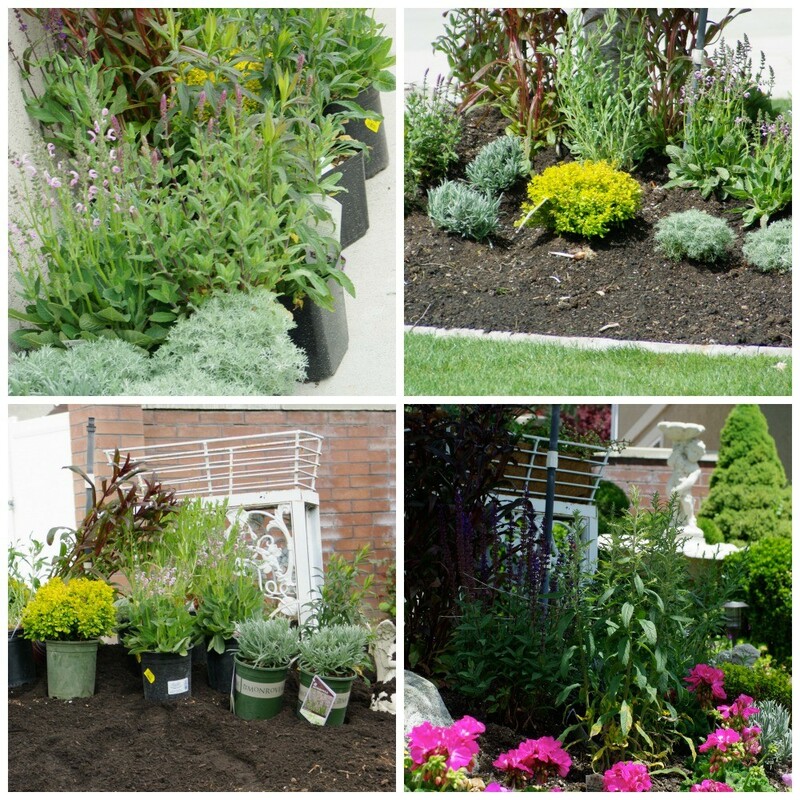 Seeing posts like this inspires me to try my black thumb at gardening again!! Yay! Definitely give it another go, its so therapeutic. What a beautiful garden! Thanks for sharing! Thank you! And thanks for dropping by. 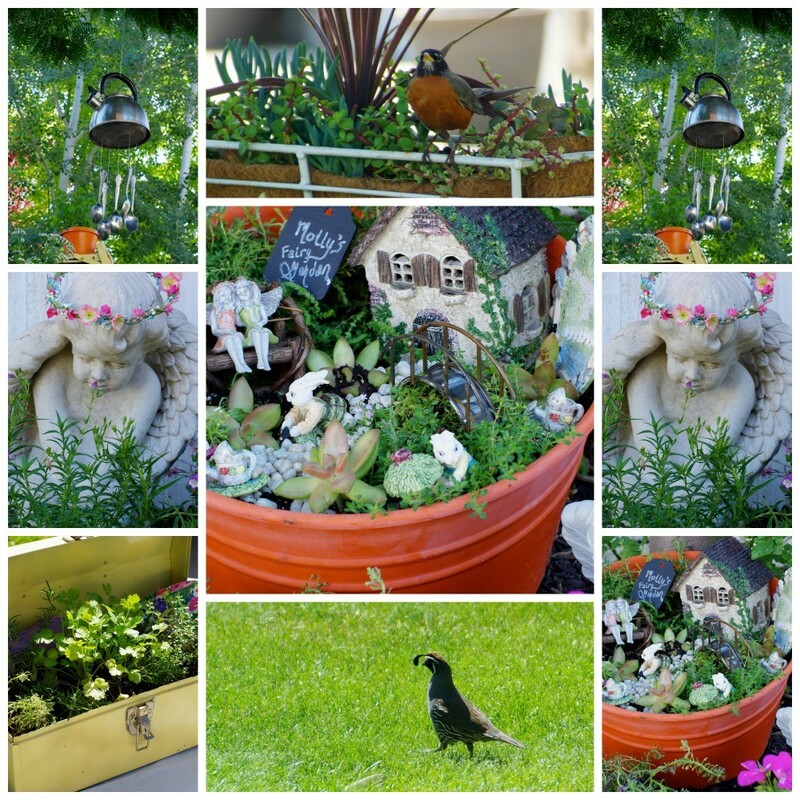 What a fun whimsical garden Trina! 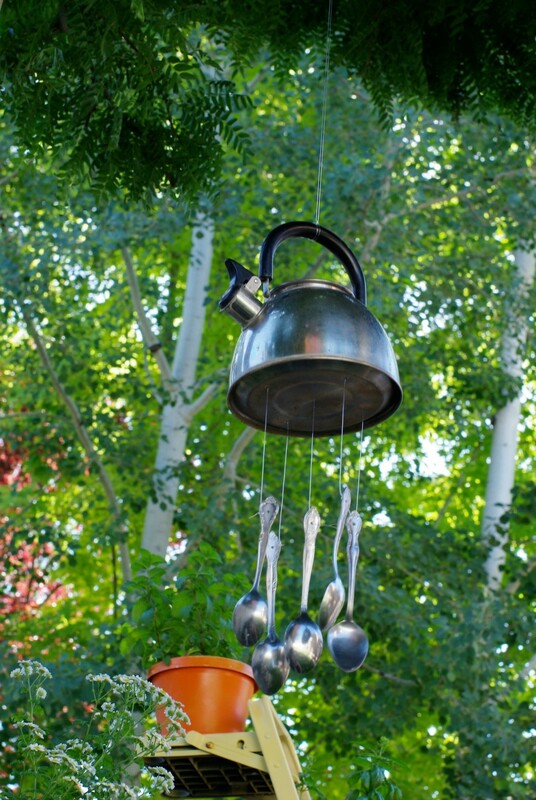 Did you make that pretty spoon wind chime? Alice, sorry for the late response, I was visiting my cute daughter. But yes, I did make the wind chime and seriously it makes the sweetest sound ever. 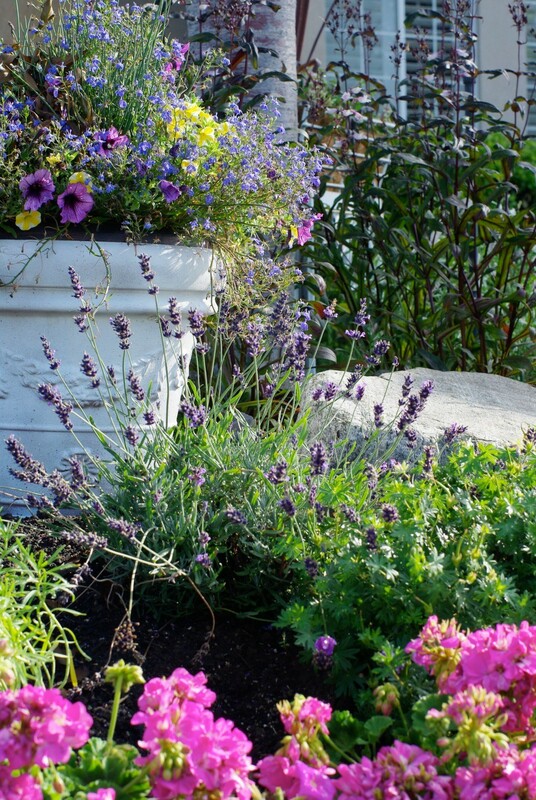 Oh Trina, what a perfect garden! 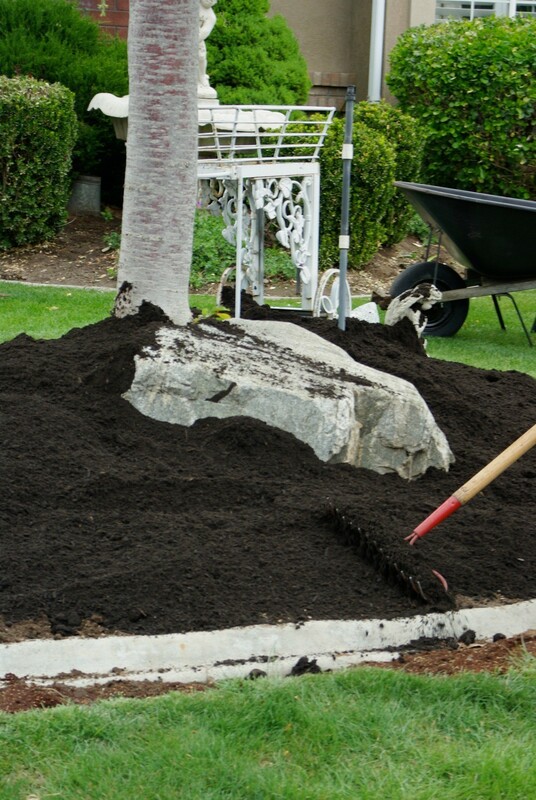 You are not just a Sunday gardener, schlepping around big amounts of dirt. Respect. Nope, I’m definetely not a Sunday gardener, but I thoroughly enjoy my mornings tending my garden, its very therapeutic. I love this! 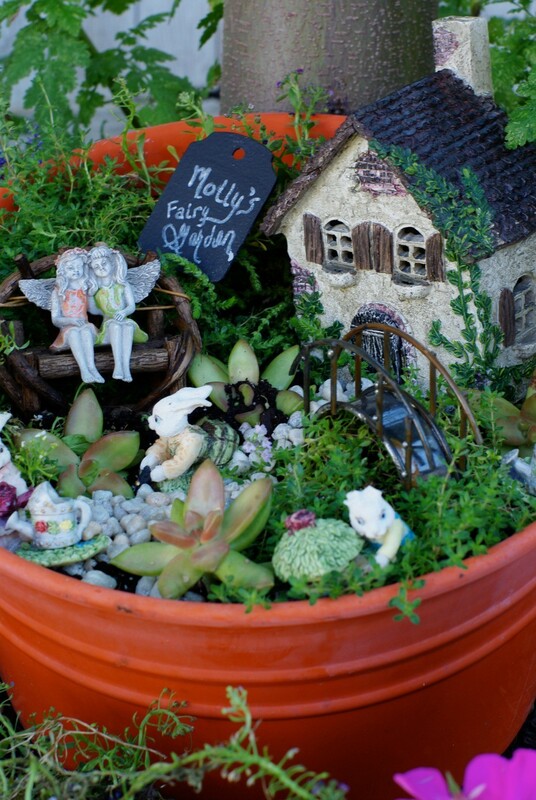 Especially the fairy garden. I also like to garden, but lately it has been overwhelming just getting the grass cut and the edges trimmed when it is so hot outside. I feel like we need to get professionals in to redo the entire backyard. That’ll have to wait though till we finish the bathroom reno and about a million other things. Sitting in a garden like this is so peaceful. Thanks for sharing! You are so right, it’s the most peaceful of feelings. I totally relate to the heat, man o man, its been over 100 here for the past week so actually you will find me mostly on the floating lounge chair in the pool. Wow, what a lot of love you’ve put into this! Beautiful. I just love watching your creative mind at work! Where to start…? 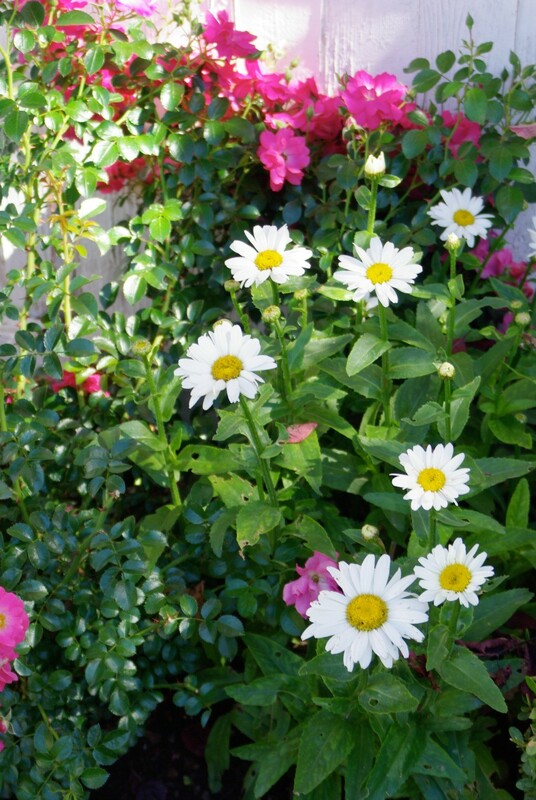 Love the painted white pot so that all of the bright colors of these gorgeous blooms and buds pop! Love the arrangements of course, and the finished product. Duh? Loved the photo of the rich soil with all of its potential coming thought as deep and fertile deep dirt the color of good chocolate. Love molly’s garden (! ) and the wreathe of flowers on the angles! You created a little patch of heave, and I still wan to stand under your wind chime and listen to the sweet music! Elle, come on over!!! Actually I will be in NYC from July 16-19th . . . 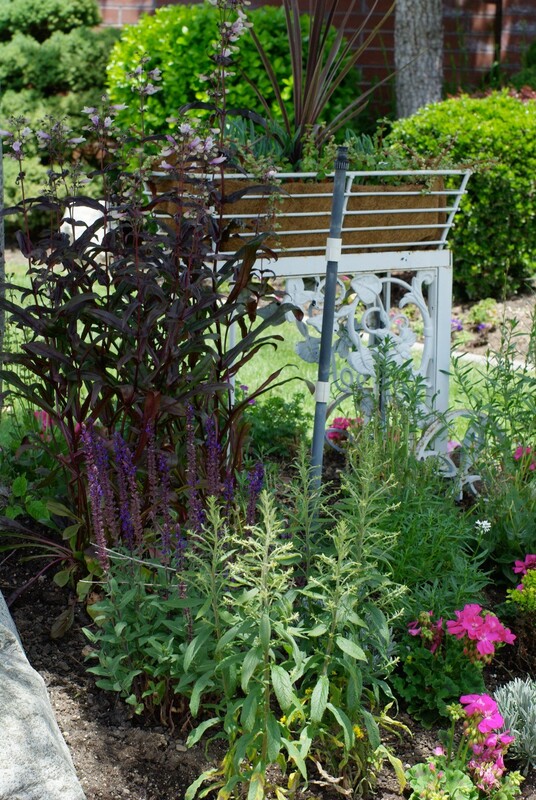 Thank you so much for sharing photos of your beautiful garden. You have inspired me to get into my garden to do a little sprucing up. I love your teakettle/spoons wind chime. What a clever idea!! Love when a post brings a little inspiration to others. 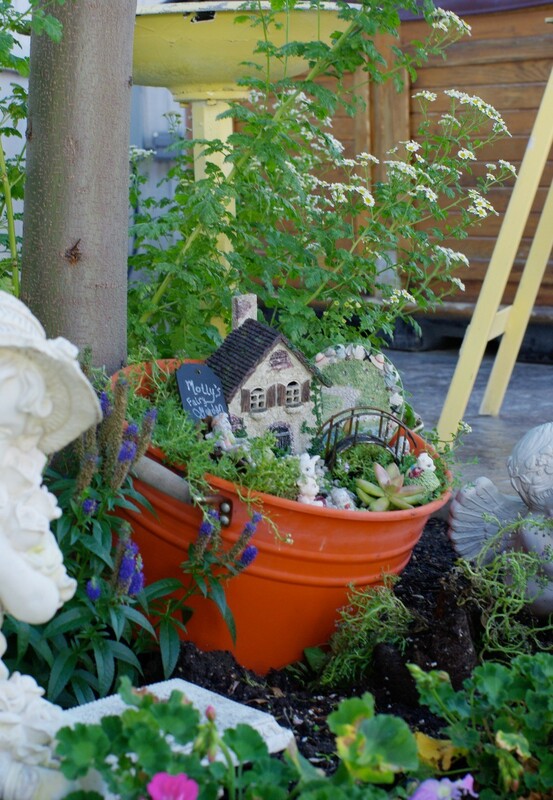 Trina, your garden is gorgeous and I love the whimsy! 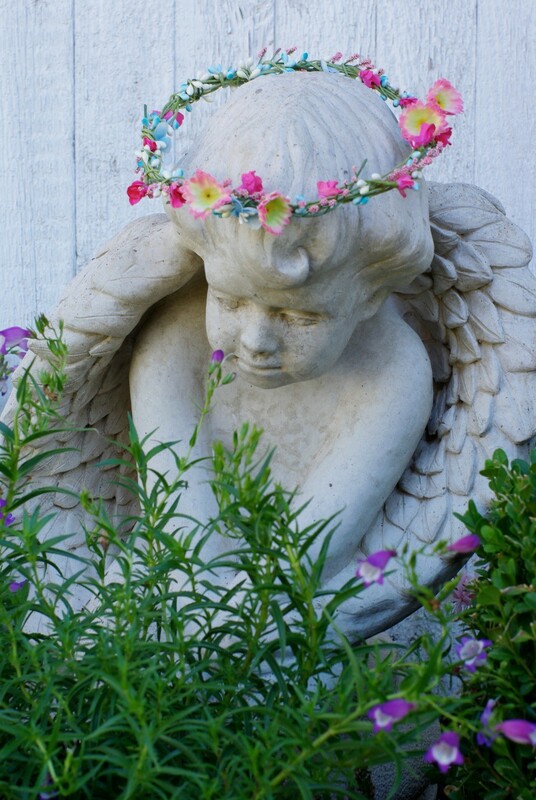 Angels and fairies, what more could a girl want? Unless of course, dark dirt. I do love it so! Your new bed is going to be beautiful! Love the hanging chime. I had a similar one, but I think it’s tucked away in our cubby. That’s another story. lol! I have that same sitting angel. I think I need to make her a crown! Thanks for sharing with SYC. Now that I’ve seen your magical gardens, I know why we were instant friends. I should have made a crown for you, what was I thinking? Or not thinking . . . Well, now that’s a good excuse for another get together.